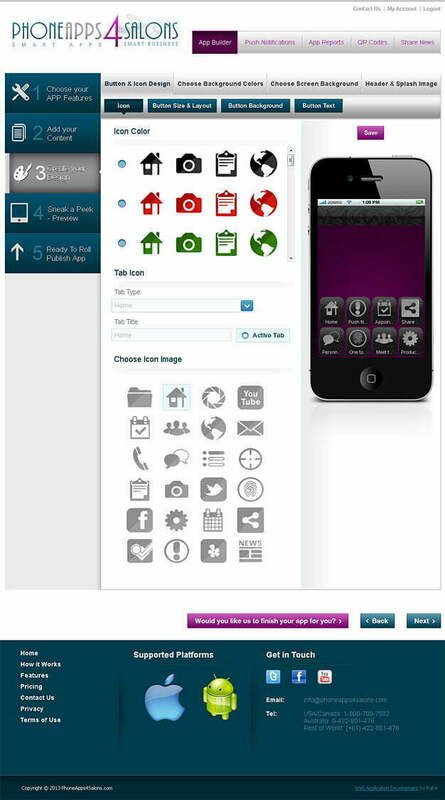 Phone Apps 4 Salons has created a mobile app building service where salons can now create their own mobile apps. Instead of paying a fortune to build an app, salon owners can now use Phone Apps 4 Salons to design their own salon app features, or do the groundwork and have the company complete it for them. Phone Apps 4 Salons provides an easy way for salon owners to sign up for free, choose their own app features, add their own content, create their own design, sneak peak a preview, and finally publish the app on Itunes. www.phoneapps4salons.com provides salon owners with a tool to improve their customer interactions. Salon owners have wide variety of exciting app features to chose from–some of which are the tell-a-friend feature, personal recommendation feature, appointment request feature, upcoming events feature, products and services feature, GPS Directions feature and so much more! Through the app salon customers are able to book appointments, be rewarded for referring friends, receive special offers, be notified of prizes and rewards when they are nearby the salon, and write reviews and win prizes! Phone Apps 4 Salons needed a mobile app building platform that was versatile and scalable to the needs of all types of salons across the world. The wizard was to be easy to use but powerful to enable a Salon owner to create their own app online. PA cutting edge app building wizard that rivals the best in terms of design, usability and the advanced mobile app features included. We used ASP.Net 4.0 with SQL Server 2008 to build a system that is simple to use and enables a salon owner to create an app in minutes. The resulting app looks professional and easy to use for salon users. The system uses advanced technologies like QR Codes, Apple passcode, Push notifications and a powerful CMS that enables the Salon owner to keep the app content fresh. The application is a success from day 1 where many early adopters have seen improved interaction with users and accolades for the app design. Contact Us for your web application development needs today.